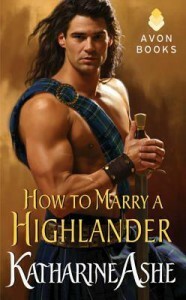 Katharine Ashe’s How to Marry a Highlander is a novella in her Falcon Club series. You don’t need to read the books in the series, but for a little background on Teresa and Duncan, you might want to read How a Lady Weds a Rogue since they make an appearance.Upon hearing the local vicar express his interest in her, Teresa Finch-Freeworth, flees her home in the country to London with one goal in mind, to marry the handsome Scotsman she can’t stop thinking about it. She seeks Duncan, the Earl of Eads and proposes marriage, but is disappointed when he doesn’t remember her and refuses her proposal. Not one to back down from a challenge, she proposes a wager; for each betrothal his sisters make with her assistance, Duncan has to give her something in return. Will Teresa win the wagers and ultimately Ducan’s hand or will face defeat?Ashe is a new author to me and everyone knows I can’t say no to a historical romance! The writing was engaging. It’s rare for an author to be able to capture the Scottish accent well enough in print and she did a great job! Oftentimes I can’t hear the accent as I read and it was a surprise to experience it with How to Marry a Highlander.Character development can be difficult in a novella since authors are limited in terms of what exactly to focus on. Ashe does a good job with it. I really liked Teresa and she has a talent for writing and telling humorous stories. It’s pretty clear she’s the type of person to watch from the sidelines and is very observant. Duncan is a mystery! I still feel like I don’t know him and I think he prefers it that way. His sisters are a riot! The poor man doesn’t get any peace with them around and they were quite fun. The biggest surprise for me was Teresa’s brother and how he was willing to help her out when he learns of her reason for being in London.As for the romance between Duncan and Teresa, they don’t spend that much time in each other’s company and that was a bit disappointing, but it’s pretty apparent Duncan is attracted to her. I would have liked a little more tête-à-têtes between them. The romances for our secondary characters don’t play a major role, but do add to the story. I have several favorite scenes, but the one that stands out is when Waldon, the vicar who wants to marry Teresa, talks to her about her reputation back home due to her association with Duncan. It’s pretty interesting what he had to say especially when Ashe delivers a slight twist at the end.If you’re a fan of historical romance I recommend Katharine Ashe’s How to Marry a Highlander. I mentioned that she was new to me and I’m really looking forward to reading the rest of the Falcon series.This review is posted at Literary, etc.